The following outlines the options for purchasing, the downgrade rights available, and how to install the SBS 2003 CAL’s. SBS 2008 of course does not require the CAL’s to be installed, you just have to maintain documentation for your CAL licensing for any potential audits. Q. How do I obtain CALs for earlier versions of Windows Small Business Server when they are no longer offered on price lists? If you need additional SBS 2008 or SBS 2003 Standard CALs; you will need to acquire Windows Small Business Server 2011 CAL Suites and exercise your downgrade rights. If you need additional SBS 2008 Premium CALs, they will remain available on the Open price lists for a period of time. This is due to the fact that the SBS 2011 Premium Add-on does not include the same components that are in 2008 Premium and therefore the SBS 2011 Premium Add-on CAL Suites do not offer downgrade rights. Q. How will SBS 2003 CAL activation work in that scenario since SBS 2011 [Edit: and 2008] does not require CAL activation but SBS 2003 does? A. If you have acquired SBS 2011 CALs through the Volume Licensing (VL) channel, you can obtain SBS 2003 CAL product keys through the Volume Licensing Service Center (VLSC); these keys can then be used to downgrade to SBS 2003 (R2) CAL’s. 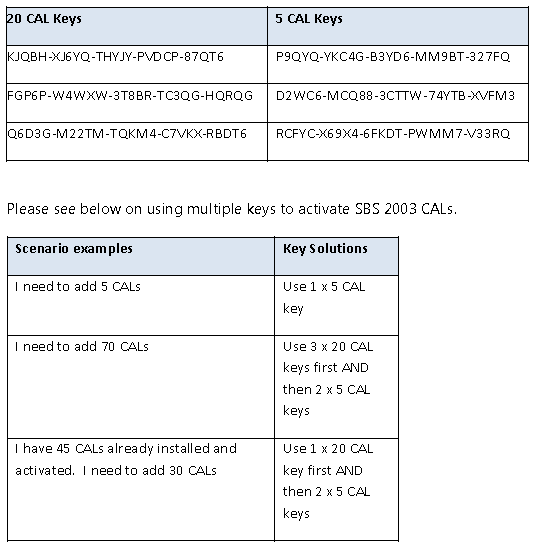 For customers who have acquired SBS 2008 and 2011 CALs from channels other than VL, such as FPP and OEM, please use the following product keys to activate SBS 2003 Standard CALs. A product key can only be used once to activate the designated number of CALs for that given key. Therefore a combination of keys may need to be used to activate all of your 2003 CALs. We have provided 3 keys that will activate 5 CALs each and 3 keys that will activate 20 CALs each. This is so customers can activate anywhere from 5 to the maximum number of 75 CALs supported with SBS 2003. It is recommended that you use the 20 CAL Keys first and then use the 5 CAL keys to avoid a situation where adding the 20 CAL key(s) last may put you over the 75 CAL limit when you have existing CALs.